Advertiser.ie - Who will be the Advertiser Tribal League's special one? It's back, baby. There will be plenty of cheers and groans as Premier League football returns to brighten up our lives this weekend. The new season kicks off on Friday evening with Manchester United hosting Leicester City and as the referee blows his whistle at Old Trafford to signal the big kick-off, the excitement at Advertiser Towers will hit fever pitch as the Galway Advertiser, Advertiser Tribal League, teams up with St Anthony's and Claddagh Credit Union for a third year running! Now in its third season the Tribal Leader League will once again pit manager against manager, colleague against colleague, and friend against friend as they endeavour to be best in the west and take home a cool €250, a pair of Galway International Arts Festival tickets 2019, a pair of Galway Races tickets 2019 plus much more. 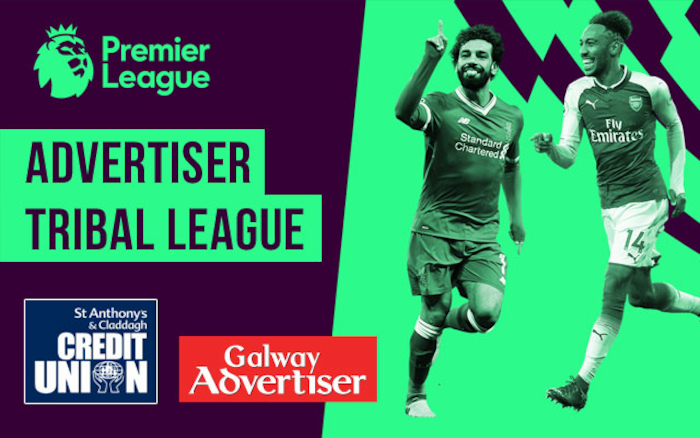 Simply add the advertiser.ie's Fantasy Football code: 1372012-311407 and join the other 200 managers who have already signed up to take home the prestigious championship title. Remember to enter before 7pm on Friday to have week one Fantasy points included. So will you be the next Pep Guardiola, Jürgen Klopp, or Jose Mourinho of the Advertiser Tribal League? Join our league and find out.